Lindenwood highlighted this week’s USAG action, putting up the highest team and individual all around scores of the season so far while two Ivy League teams and Air Force also registered season highs. We’re seeing team scores creep up across the board, and it’ll be very exciting to see how RQS impacts rankings in a few weeks’ time. 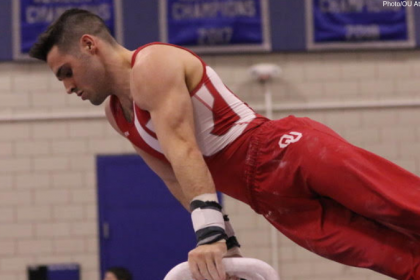 We wanted to show more love to the non-top teams in college gym in 2019, so we broke out our Dismounts into DI, DII (all USAG nationals teams) and DIII. Each week, we’re also dishing out a few superlatives for some of our favorite moments, looks and results from the weekend of competition. Below those, you’ll find your typical results and highlights from every DII and USAG nationals-eligible team’s meet. For reference, teams eligible for USAG nationals include those with less than seven and a half full scholarships. They include Ivy league schools, all DII teams, Air Force, Centenary and SEMO. Note: Penn has opted out of competing at USAG nationals this year, but we will continue to feature it here. 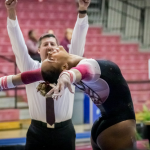 Mitchell’s breakout sophomore season keeps getting better: The Lindenwood gymnast set a career high in the all around and on three events this week to become the No. 1 all around gymnast across all USAG teams. This 9.900 beam set is spectacularly executed. The Big Red set a season high of 49.050 on floor, only three quarters of a tenth from its program record. The rotation was led by a career high 9.900 from sophomore Claire Haklik and the season debut by Izzy Herczeg. The Big Storyline: It was senior night at Air Force, and the Falcons posted a spectacular season high led by sophomore Anna Salamone’s career high-tying 9.900 on bars, as well as Tyler Davis’ strong day in the all around. Seattle Pacific put up a middling score with two important gymnasts missing (see controversies), helped by an all around season high by McKenna Zimmermann. Implications: Air Force will remain at No. 6 in team standings, while Seattle Pacific will drop one place to No. 11, passed by a season high from Brown. The Big Storyline: UIC’s 195 streak has come to an end. This was not a bad meet for the Flames, but they failed to get the late-lineup big numbers that have propelled them forward in other meets this year. Implications: UIC will be starting to get nervous about its lead in the MIC and USAG rankings after Lindenwood put up a 195.350, highs in both the conference and in USAG. The Big Storyline: For the first time in weeks, Bridgeport didn’t count a fall in competition, which is a great sign for the Purple Knights and resulted in one of their higher totals of 2019. Sophomore Kathryn Doran stood out with a 9.900 on bars while freshman Julianna Roland claimed yet another all around title, as well as a share of the vault honors. Implications: Bridgeport’s three top scores in 2019 are all on the road, meaning it’s extremely well-placed for RQS. It wasn’t able to improve its ranking from No. 3 this week as neighbors No. 2 Lindenwood and No. 4 Yale both had exceptional weeks as well. The Big Storyline: Yale had a great meet led by a historic beam rotation that included two top 10 routines in Yale history, a 9.850 for freshman Lindsay Chia and a 9.900 for sophomore Jacey Baldovino. The Bulldogs’ beam rotation was the second best in program history, and they also put up their 10th best all time vault score. Implications: The Bulldogs remain at No. 4 in USAG rankings but increased their lead over No. 5 TWU. Records: Yale had two individual career highs on beam. The Big Storyline: Once again, freshman Anna Kaziska is the bright spot in SEMO’s incredibly challenging 2019. The Redhawks continue to field only eight gymnasts across the lineups, and since most of the rest competed earlier in the year, it seems likely that eight is the sum total of healthy athletes on the roster. Implications: SEMO remains at the bottom of the USAG rankings. The Big Storyline: Lindenwood was spectacular on Friday, registering the highest score of the USAG season on the power of a career best day in the all around from Courtney Mitchell that also included personal bests and individual titles on every event but vault. Ryan Henry also excelled with a 39.125 in the all around and Aleah Leman was able to pick up an individual vault title. Implications: Lindenwood remains in No. 2 in USAG rankings, but it moved much closer to UIC. Mitchell passed TWU’s Bria Northrop to become the No. 1 all arounder. Records: Mitchell’s incredible day was the second highest all around score in program history. The Big Storyline: Cornell set a season high by almost two points in a loosely-scored-but-still-excellent senior day performance. The Big Red also swept the event titles. The seniors had a great final meet in Ithaca, with Christina Luniewicz, Lyanda Dudley and Malia Mackey walking away with individual wins. Records: Freshman Donna Webster’s title-winning vault and Claire Haklik’s 9.9 on floor are in third in program history on the respective events. The Big Storyline: West Chester set season highs on three events and in the team total in a fantastic meet that also included several personal best scores. The Golden Rams continue to excel on beam and floor, coming in at No. 6 in USAG on both. Implications: West Chester remains at the No. 8 ranking this week, slightly expanding its margin over No. 9 Southern Connecticut. 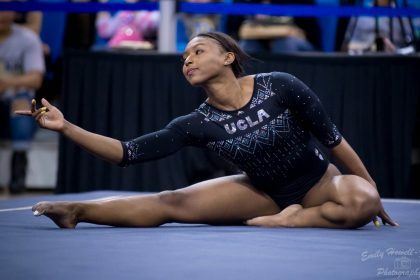 Records: Rose Fanara’s title-winning floor performance was a personal best. The Big Storyline: Brown soared at home to register a season high by over a point. 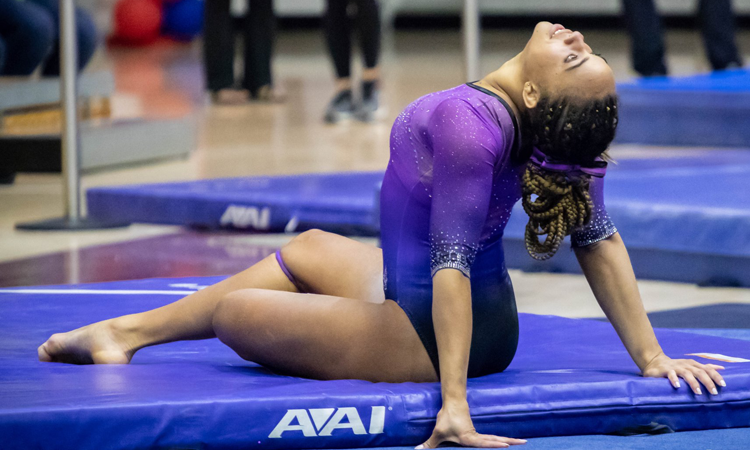 Freshman Sophia Petrillo won her second consecutive all around title while fellow freshman Mei Li Costa picked up yet another vault title, and sophomore Kate Nelson set a career high on bars. Southern Connecticut’s superstar freshman Hannah Stahlbrodt had the first beam fall of her college career and narrowly missed out on an all around title, but she still led the team on two events and set a career high on vault. SCSU had a great day on the whole, with fellow freshman Noely Macias winning her very first beam title. Implications: Brown moves up one ranking spot to pass Seattle Pacific, but the Bears’ big move is a few weeks away; they’re still counting two much lower scores from their nightmare first weekend at Alaska, and the moment RQS rankings begin and the Bears can drop the lower of those two meets, they’re likely to leapfrog both West Chester and SCSU.